The chain is a major component in a drag conveyor’s design, and it’s as crucial to the conveyor’s performance as any other component. Drag conveyor chains are hardly ubiquitous, however, and each manufacturer touts the working load or construction or design of their chain. So what makes for the best drag conveyor chain? To answer that question, you first have to understand something about chain corrosion and abrasion. We’ve learned that chains in conveyors that move green wood residues wear primarily through corrosion. This is because wood is acidic. Now, we use steel chains in drag conveyors because of their strength and because of the additives we can place to adjust the metallurgy. But acid, of course, eats steel. As the surfaces of the chain erode, they become abrasive, which compounds the problem of wear. This corrosion process is especially problematic in the pin and bushings. Erosion often causes the pins to fail before other parts of the chain, despite the fact that, in most chains, theoretically, other parts should yield before the pins do. This is the case with an 81X chain. According to calculations, the sidebar in this chain should break before the pins do. But theory is often different than practice. It’s this realization about the corrosive effects of woody biomass acid on chains that led us to design our T-Series chain as we did with a massively oversized pin. 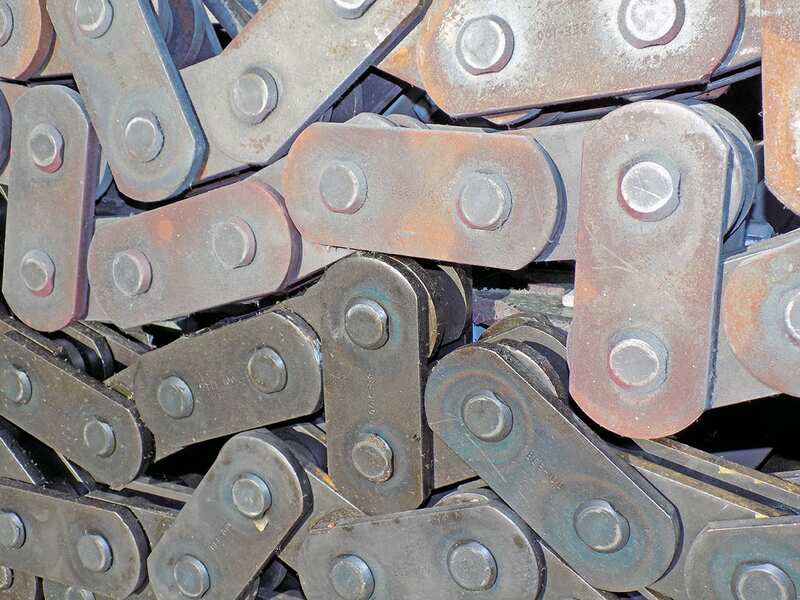 The pins in our T-Series chains can be heavily worn and still be stronger than the sidebars. Corrosion is also a reason why we designed our drag conveyor chains to run outside the material path. Less exposure to acid means less corrosion, which leads to longer chain life. Combined with corrosion, mechanical wear also greatly affects the performance of drag conveyor chains. While corrosion is essentially “wiped away” from the external chain components, internal corrosion around the pin remains, and this abrasive corrosion mechanically wears the pin. Because of this mechanical wear, it’s important to reduce the number of times the chains bend. In our conveyors, we keep chain movement to a minimum as the chain runs outside the material path along wear strips, so the chain only bends as it rounds the sprockets or goes around a curve. In single-chain conveyors, however, the chain wiggles constantly as the paddles bend the chain sideways (single-chain paddles don’t load evenly) and the chain rumbles over and through material. This movement causes the chains to wear faster. Manufacturers looking at different conveyors should consider how the chain is carried. In our design, we carry the chain assembly on the chain sidebars. Inside our conveyors, the chains run along low-friction UHMW wear strips. These strips not only bear the chain weight as it runs through the conveyor, but they save the chain from the wear that occurs when chain is dragged across the bottom of the conveyor, which is how many equipment manufacturers design their drag conveyors. It also keeps it straight, reducing the pin and bushing movement and thus extending the its life. Dragging a chain across the conveyor floor is problematic because it not only wears the chain but the floor itself. As a result, maintenance crews commonly have to replace their conveyor floors whenever they replace the chain. It’s also for this reason that conveyor manufacturers commonly put abrasion resistant floors in their conveyors. As a note, if you think plastic wear strips will wear out too fast, you’re wrong. For one, UHMW plastic has a high pressure rating, and the total weight of the chain assembly divided over the surface area contacting the plastic is well below that rating. So, the plastic isn’t going to quickly deform and degrade under the weight and movement of the chain. The horizontal forces on the chain also reduces the downward pressure of the chain on the wear strips, thereby reducing what wear occurs. Second, as the chains run along the wear strips, they form grooves under the sidebars. Once these grooves form, the weight of the chains is additionally carried by the rollers. At this point, wear greatly reduces. The third thing that makes for a good drag conveyor chain design is low friction. Indeed, if you want a conveyor that lasts longer as a whole, find one with low friction loads. Friction is another reason why we don’t run our chains on the floor in the material path. Not only does the chain and floor wear increase when this is done, but the friction puts additional load on the chain. It also decreases efficiency. Not only are you using energy to move material, you’re using it to overcome friction. Over the conveyor’s lifetime, poor efficiency can cost thousands of dollars extra in energy. The same applies if the paddles touch the floor or walls. When friction increases, efficiency decreases and wear occurs faster. Fourth, a good drag conveyor chain will also be strong enough to withstand the forced placed on it. It will have a high working load relative to its weight. It’s important to understand that companies use different factors to determine the working loads of their chains. The calculation isn’t standardized. It’s different than calculating ultimate strength, during which engineers determine which part of the chain will yield first and with what amount of force. Instead, they calculate the working load using a number of internal factors as a percentage of the ultimate strength. This percentage varies tremendously. We’ve seen factors as low as 8 percent to as high as 20 percent. When determining how to calculate the working load of chains, we looked at what different companies used to calculate working loads and tossed a lot of it out the window, opting to work with conservative factors, which we apply consistently to all chains. This ensures that we never overestimate the strength of our chains. And it’s important because we use working load as a factor to determine which chain and which conveyor will best work for a given application. What you want is a chain with a high strength-to-weight ratio that hasn’t been overestimated. It’s not helpful to have a chain that’s capable of high working loads but weighs too much (a low strength-to-weight ratio)—your conveyor system works not only to move material but the machine’s components; heavier chains make the system less efficient. When it comes to working loads, it’s also worth noting that single-chain drag conveyors are at a huge disadvantage compared to dual-chain designs. The most obvious reason is that a single chain carries all the force. In a dual-chain setup, each chain carries half the load. A poorly designed chain isn’t going to help in the long run. And a “heavier” chain is sometimes worse than a lighter chain if it has a low strength-to-weight ratio. A poor choice in chains means more maintenance. It means more replacements. It means more money spent in the end. You don’t want a drag conveyor with a chain that will require more time, energy, and cost. Go with the professionals who better engineer their products. Get something with better performance. This article was posted in General and tagged chains, drag conveyors. Bookmark the permalink. Follow comments with the RSS feed for this post.Post a Comment or leave a trackback: Trackback URL.